HDMI (High Definition Multimedia Interface) is a digital interface for transferring HD video and audio. As the signal is transmitted in a digital format it provides pixel perfect pictures with no loss. An HDMI Cable is used to transfer the picture and sound, the latest high speed with ethernet cables also support a data connection to allow connected devices to pass internet data through the cable. An HDMI Splitter can be used to replicate an HDMI signal, it makes a perfect digital duplicate and allows you watch the signal on multiple TVs. If you don't have enough HDMI inputs on your TV, you can use an HDMI Switch to connect more than 1 HDMI device, each device connects into the switch and you select which device you want to watch. To send HDMI over long distances an HDMI Extender can be used, these send the HDMI over CAT5 or CAT6 network cable, single cable and dual cable extenders are available and can be used to send the signal up to 120 metres depending on the resolution and cable used. HDMI Adapters can be used to convert between the different HDMI connector sizes or to create an angled HDMI connection where space is tight, such as fitting a TV close to a wall. Using an HDMI Converter the HDMI signal can be converted to other formats such as component video, scart or VGA. 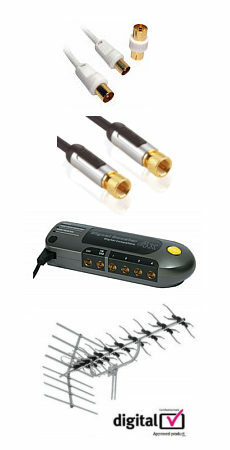 An HDMI Audio Extractor can be used to decode the audio stream and connect it to a sound system or soundbar.